Access allows you to configure several things on database start up. For instance, you can hide the Navigation Pane, launch a splash screen or a switchboard form, set an Application Title, set an Application Icon, and several other things. In the Access Options dialog, choose Current Database. At this point, the form is fairly self-explanatory. 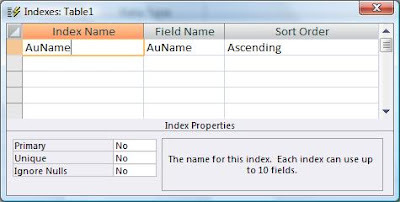 To set an application title, simply type it in the Application Title box. To have a certain form open on start up, select that form in the Display Form combo. To hide the Navigation Pane, scroll down and uncheck Display Navigation Pane. You can also allow or disallow special keys, menus, or shortcuts; turn AutoCorrect on or off; modify the Navigation Pane; change window style between Overlapping or Tabbed; and control many other properties. Play around and see how it works. Access 2007 is similar. Go to the Office “pizza” Button (upper left), and choose Access Options at the bottom of the form. From this point most everything is the same. 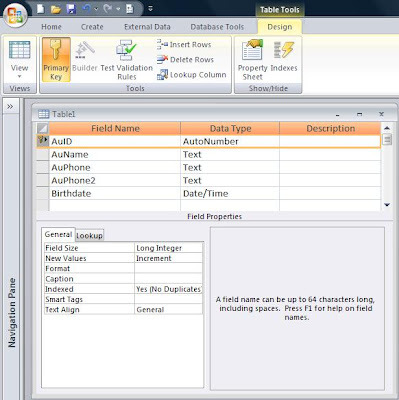 Open the Database Window and right-click on any Object. You will get a context sensitive menu. Choose Start Up.... You will see the following dialog box. Access 101: Can I Create an EXE from my Access Application? There is no way to create an EXE from an Access database. However, there is a way to install what's known as the "Access Run-time engine" that will allow the user to run the app without having Access installed on their system. The Run-Time is NOT the same as an EXE. For one thing, anyone who has Access on their system will still be able to open the application in their copy of Access (assuming they have the right version). (http://msdn.microsoft.com/en-us/office/aa905403.aspx). In Access 2007, you can download the 2007 Developer Extensions and Runtime(http://office.microsoft.com/en-us/access/HA102188681033.aspx). To run the Wizard, go to the Visual Basic Window, choose Tools, select the wizard, and follow the directions. 1) NEVER use macros. If the macros fail, you don't get the HALT screen, the whole app just crashes. 2) Error trap EVERYTHING. You want a graceful exit from every error. This is good practice regardless. 3) Don't rely on the native Access toolbars or menus. You must provide all functionality yourself. For instance, if you rely on the Find button (binoculars) to search for a record, forget it. This button won't be available to the app when using the Run-time. 4) The install disk created with the wizard will be very much larger than your program. However, in this day of CD burners, this is not the issue it once was. Now, one thing you can do to keep your users from modifying the application is to convert it to an MDE. This is not an executable either, but it DOES have all of the source code removed. That means the user cannot open a form, report, module, or macro in Design view. Tables and queries can still be modified though. So between converting the app to an MDE and deploying it with the Access Run-time, this comes very close to the functionality of the EXE you are looking for. In Access 2000 and later, this is easy. Access provides an object called CurrentProject, which refers to the currently opened database. This object as two properties (among others) called Path and Name. Access 97 doesn't have the CurrentProject object, but it does has the CurrentDb object. This can be used in a similar fashion. CurrentDb also has a property called "Name", but unlike CurrentProject.Name, CurrentDb.Name returns the entire path and file name. Why? Well, first we'll look at what an Ambiguous Outer Join is, and then see how to correct it. Microsoft Access has three types of joins: the Inner Join, the Right Join and the Left Join. Both the Right and Left joins are known as Outer Joins. An Inner Join shows only those records that exist in both tables. However, an Outer Join (both Right and Left) shows all of the records from one table (the Base Table) and just the matching records from the other (Secondary Table). 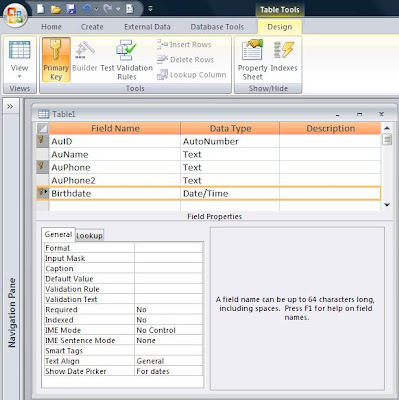 When Access processes a multiple table query, it needs to determine the order in which joins should be made. Should it join Table1 to Table2 first and then join Table3? Or should it do it in some other order? This is part of the Rushmore technology of the Jet engine. It tries to determine the most efficient way to process the query. In the case of standard Inner Joins, the result set will be the same, regardless of the order in which they are joined. However, this is not the case with Outer Joins. There are times, when using an Outer Join, that the result of the query will be different depending on the order in which joins are created. In this case, Access cannot determine the order to join the tables. This is an Ambiguous Outer Join. So how do you know when an Outer Join will result in an error? The easiest way to understand it is in terms of what you see in the Query Builder grid. A table which participates in an Outer join as a Secondary Table (that is, the arrow is pointing *towards* it) cannot participate in either an Inner Join, or as a Secondary Table in another Outer Join. Figure 1 shows two types of queries that will result in an Ambiguous Outer Join error. However, the table participating in the Outer Join as a Secondary Table can participate in another Outer Join if it is the Base table of the other Outer Join (that is, the arrow points *away* from it). Figure 2 shows a query that will not result in an Ambiguous Outer Join error. So what do you do if you need to create a query like case 1 or 2? You have to split the query into a stacked query, that is, two queries, the second of which uses the first. This is exactly what the Ambiguous Outer Join error message suggests. 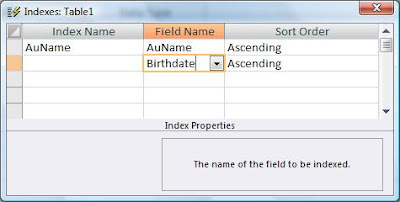 Create a query joining the first two tables with an Outer Join and save it as a named query (i.e. Query1). Then, in a second query, join the first query to the third table. Figure 3 shows how to build a stacked query. Figure 3: Shows how to split the query into two queries to avoid an Ambiguous Outer Join. So the Ambiguous Outer Join error is not really all that confusing. It simply means that the database wants you to decide which join it should create first. In Access, you do this by spitting the query into a stacked query.